The recent release of the Census Bureau’s Voting and Registration data from the Current Population Survey finally allows us to look deeper into the population that turned out to vote this last November. And the results are quite astonishing. For the first time, in a long history of disenfranchisement and suppression, African-American voter turnout surpassed the turnout rate among whites. 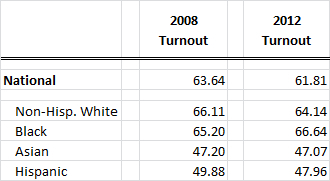 2012 was a low-turnout election overall, especially when compared to 2008, and the turnout rates among most of the major racial and ethnic groups went down from 2008 rates. The turnout rate among blacks in 2012, however, went up. * Turnout is measured here as total votes divided by the voting-age citizen population. Data are from the CPS microdata for the Voting and Registration Supplement. About two-thirds of Virginians voted last Tuesday! 65.3% of eligible Virginians voted in last week’s presidential election (based on unofficial results and an estimate of the number of eligible voters in Virginia*). 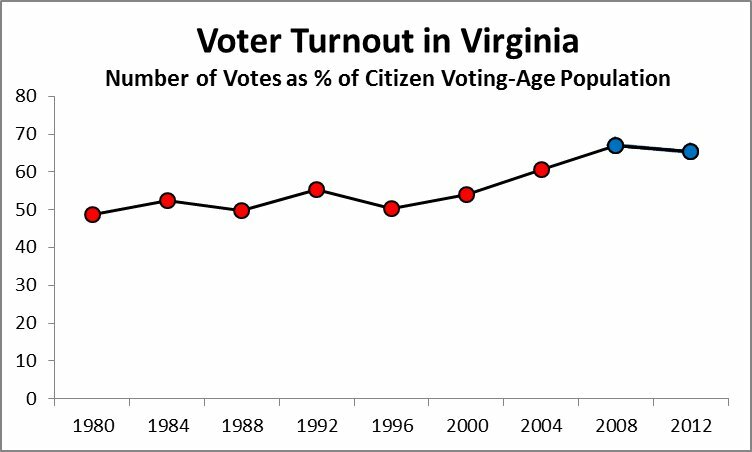 This represents a modest decline from 2008, when 66.7% of eligible Virginians voted, but the drop off in 2012 is minor at less than 2% and turnout in 2012 is still on the high end for Virginia historically. How does turnout across the state in 2012 compare to 2008? Now that the votes are cast, we have some real electoral data to explore. 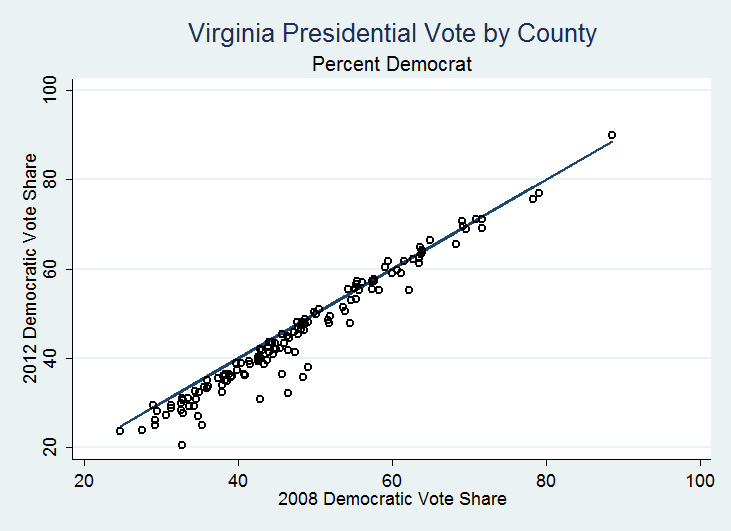 My first question was how the distribution of Obama’s vote in Virginia in 2012 compared to 2008. Using the unofficial results currently reported by Virginia’ State Board of Elections (with 2,573 of 2,588 precincts reporting), I plotted the percent of votes cast for Obama in 2012 and 2008 by county. The diagonal line shows the point at which vote shares in 2012 are the same as in 2008. In my humble opinion, the biggest news coming out of the election last night was not Ohio. Instead, the polling results coming out of Virginia, that heavily favored Obama early in the evening, set the tone for the entire night. The story of what happened in Virginia exemplifies where our politics in this country now stand. Obama’s repeat victory in the Old Dominion underscores what was probably the biggest factor in the 2012 election: demographics. For our regular readers, especially those who read our Red State, Blue State report back in July, this shouldn’t come as too much of a surprise. Ohio, Florida, and other swing states are used to the attention and have been “purple” for a long time now. Obama’s repeat victory in Virginia, however, a state that has voted consistently for Republican presidential candidates before 2008, is really big news. More than anything else, Obama’s victory in Virginia means that 2008 wasn’t a fluke, but rather represented a fundamental political realignment in the country. That realignment is bad news for Republicans. The Republican party has serious demographic problems. Virginia’s shifting demographics, like that of the nation, have been dramatic in just the last few decades with Hispanics and Asians driving most population growth and changes in the electorate. Republicans have had considerable difficulty gaining the votes of these groups. In Virginia, most of the influx and growth in Hispanic and Asian populations is occurring around the Washington D.C. suburbs in Northern Virginia (NoVa). It was therefore not surprising that NoVa was the focus of the national news media, and results from that region look more like those from 2008 than from 2004. Last week’s release of the now infamous Mother Jones video of Romney’s comments on the “47 percent” of Americans who don’t pay income taxes has everyone talking about the U.S. tax system. Despite this election cycle’s relative dearth of substantive, detailed policy discourse, the campaigns and the media have indeed provided the public with a lot of useful information on the way taxes work in this country. The terms “Capital Gains” and “carried interest” have entered the common vernacular and it seems that everyone now knows about the “Buffet Rule” and the tax rates for certain types of income.